Flying solo, or need to feed a hungry gang? Order burgers, wings, ribs, steak, and many more menu items from a TGI FRIDAYS restaurant near you. Get TGI FRIDAYS delivered to your door! Born in New York, TGI FRIDAYS is the quintessential American bar and grill. 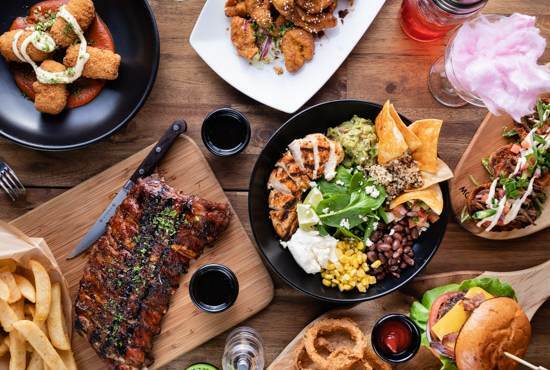 Founder of the iconic ‘happy hour’, TGI FRIDAYS is famous for great food using quality local produce and has become a favourite place for friends and family to get together. Honestly tell us what you feel like, and TGI FRIDAYS most likely has it, or a version of it, on their menu. In the mood for wings? How about Spicy Buffalo, Smokey Chipotle or FRIDAYS Signature Glaze made with Jack Daniels? Hankering for a juicy burger? What about a Carolina Crispy Chicken, with pickled slaw and BBQ mayonnaise, or the Ultimate FRIDAYS Signature Glaze, with (get ready for this) 2 beef patties topped with melted American-style cheese, aioli, peppered bacon, lettuce, tomato, pickles, onion and Cajun battered onion rings? Log onto the Menulog app or website and within a few taps your hearty TGI FRIDAYS meal could be delivered right to your doorstep!